Cornstalks and Chrysanthemums original watercolor painting 5"x7"
It's such a joy to visit a farm stand in the fall - so many treasures to delight the eye and to bring home: crisp apples, pumpkins, colorful mums and dried cornstalks for your porch or lamp post. There are so many ways to paint the same thing. When it comes to painting subjects that are normally dull such as a gray rock, for instance, or tan cornstalks, one can look for a paint color that matches the gray or tan, but I much prefer to get colorful! There is so much more life to a watercolor when primary colors are allowed to mix on the paper rather than coming out of a tube. So I wet the area of the cornstalks and drop reds, blues and yellows onto the wet paper. 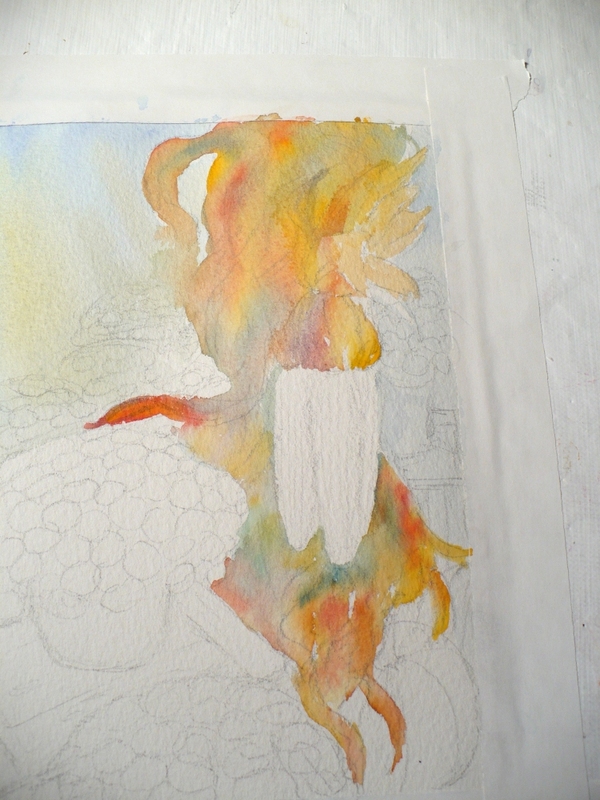 This looks a bit too colorful at this stage, but that's good! It makes a great base for the cornstalks. Next, I add the base colors for some of the other objects. Here you see two of the mums, the pumpkin and the wooden box that one of the mums is perched on. 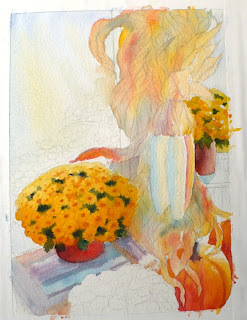 These are also painted wet-into-wet with lots of luscious color from my primary palette of reds, yellows and blues. Notice that no details are added yet. Here I've added some details to the objects. I could have painted the entire piece with base colors before adding details, but wanted to see how these would look first. 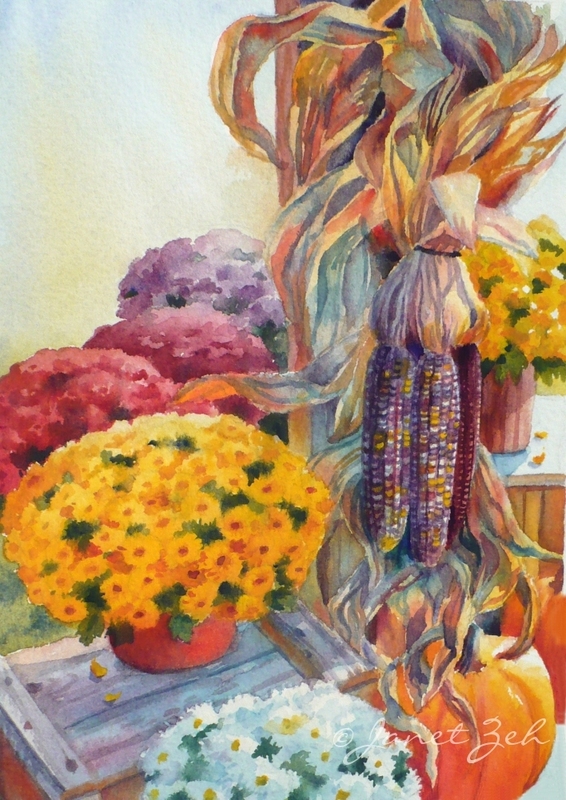 I also painted some shadow areas on the corn. Now I've added the rest of the mums and other details leaving the Indian corn and cornstalks for last. 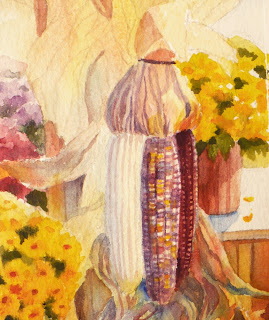 Do you notice that, now there are more colors in the painting, the cornstalks no longer look too colorful? 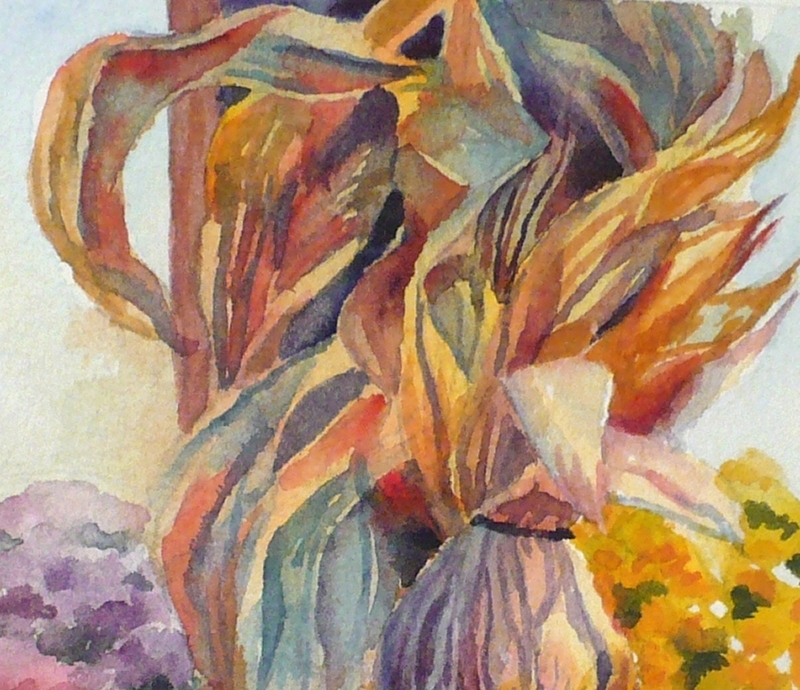 The Indian corn was fun to paint. I added vertical lines and then just went up and down the rows to add small horizontal lines for the kernels of corn. Then I painted in random colors of orange-red, yellow and violet for the kernels leaving some of them white. The far right corn is all deep red. 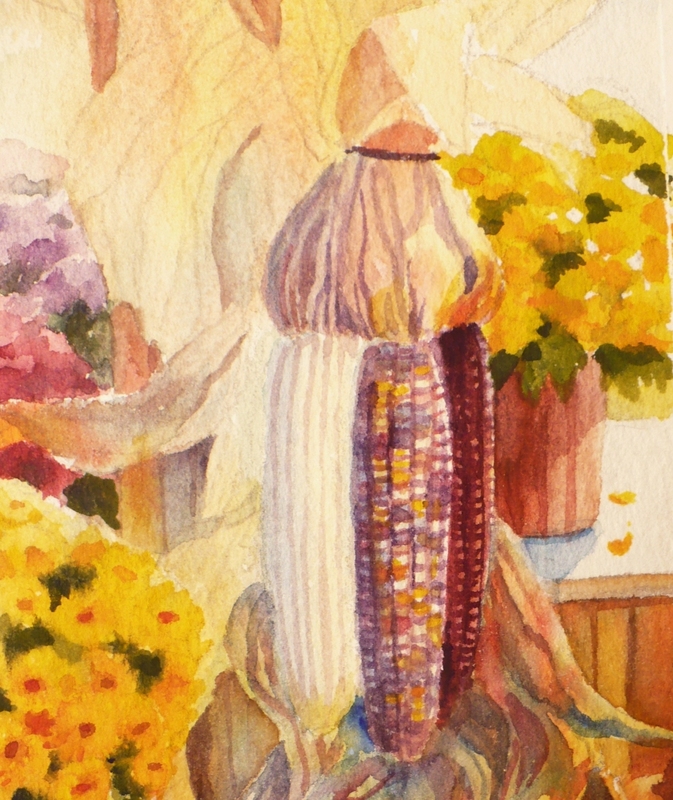 The most detail work was in the cornstalks. But since my base colors were already there, it made it easier. 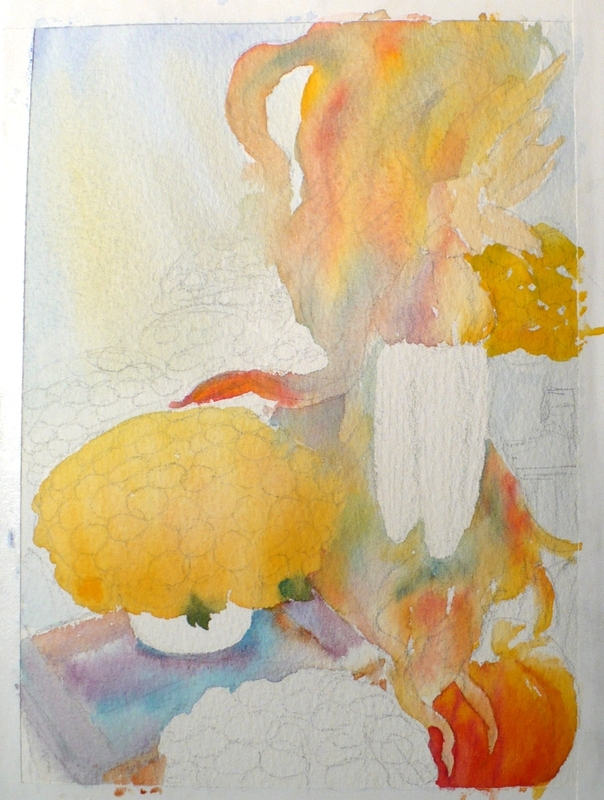 I just needed to strengthen the colors as needed and add some deep shadows and lines to indicate the dried leaves. Aren't they much more interesting when painted this way than if I'd used a flat color? And here is the finished painting! 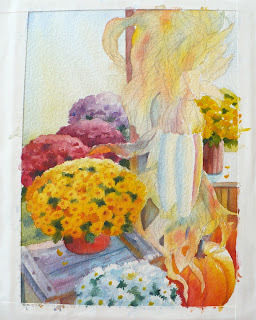 Cornstalks and Chrysanthemums is sold, but you can contact me to have one made just for you. Thanks for stopping by. Hope you enjoyed the demo. Have a lovely day!